APGM CEO Mary BarraIn a three-part series for Business Insider, Sherwin, the COO of leadership consultancy Zenger Folkman, examines women's leadership effectiveness, representation in corporate America, and solutions for increasing their ranks, building upon the firm's research first published in a 2012 Harvard Business Review article. In today's large organization, as women climb up the corporate ladder they vanish. While the statistics vary slightly around the world, this is an extremely consistent pattern. At the lowest levels, more than half of the employees in organizations are female. As you move to each successively higher level in the organization, the number of women steadily shrinks. 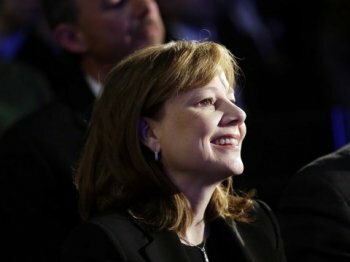 At the CEO level, worldwide, there are only 3% to 4% who are women. We find this to be a puzzling, even mysterious phenomenon when you examine the hard data that describes the overall success that women have when placed in successively higher leadership positions. It is even more curious when you analyze the success they have in those functional areas that have traditionally been dominated by males. For more than a decade, our organization has been collecting 360° feedback data from leading organizations worldwide. We now have 450, 000 feedback instruments pertaining to about 45, 000 leaders, covering a wide variety of industries. The studies that follow include our most current data collected in 2011 and 2012. The sample we have used includes just under 16, 000 leaders of whom two-thirds were male and one-third female. 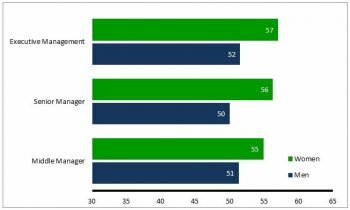 Each participant had on average 13 respondents, including their manager, their direct reports and their peers. 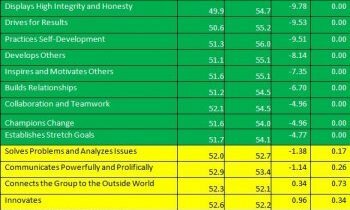 An aggregate look at how women leaders compared to their male counterparts shows the following. Zenger FolkmanBecause of the large sample size for this study the difference shown here is statistically significant and does not occur by chance. 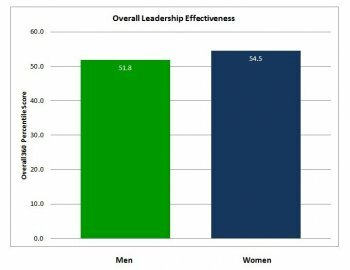 To better understand the differences between males and females it is instructive to look at overall leadership effectiveness by age. The effectiveness of women as leaders appears to change over time. 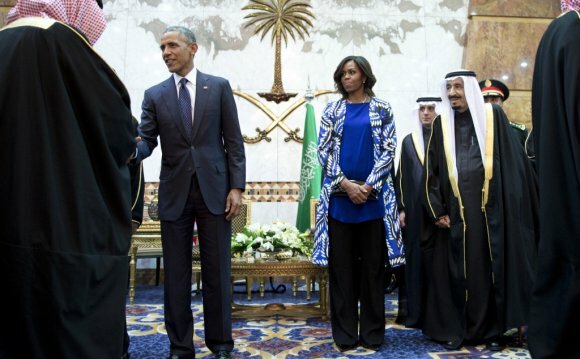 As women and men begin their careers there is very little perceived difference. Then men soon are perceived to be slightly more effective than women. As women mature they are perceived in an increasingly positive way and more effecting than their male counterparts. The gap between them and men continues to diverge, until they reach their 60’s, when the gap begins to narrow. At its peak the largest difference between males and females is 9 percentile points. 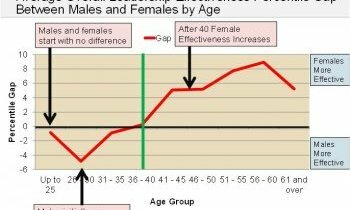 The following graph shows the average percentile gap between males and females. When we looked at our data on males and females, we looked at results from a competency called “Practicing Self Development.” This competency measures the extent to which people ask for feedback and make changes based on that feedback. We know that as most people begin their career they are very motivated to ask for feedback and take actions to improve. Over time most people gain competence and tend to not ask for feedback as often. Zenger FolkmanThis graph shows percentile scores from men and women on the competency of practicing self development. Note that the results are fairly similar until about 40 years of age. At that point women maintain the habit of asking for feedback and taking action to improve. Note that the effectiveness of men on this competency continues to decline as they age. Men assume that they are doing fine and don’t really need much feedback. Note the large difference on the first competency, “Takes Initiative.” Each reader will probably have some theory as to why this is so. Our explanation gravitates toward the double duty, which many women live with that necessitates them getting things done in order to survive. The majority of people we talk with make the assumption that women will excel at nurturing competencies such as developing others, inspiring and motivating others, relationship building, collaboration and teamwork. 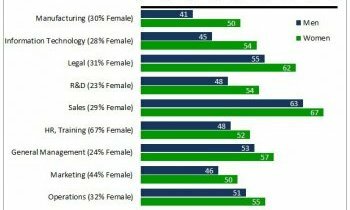 The chart above demonstrates that these competencies are more positive for women. But those competencies with the largest positive differences are taking initiative, displaying integrity and honesty, and driving for results. These are not nurturing competencies. These competencies highlight that women were seen as more effective in getting things done, being role models and delivering results. These skills describe leaders who take on difficult challenges, ensure that people act with integrity, and who simply achieve challenging results. Zenger FolkmanWe found it interesting that in the traditional male bastions of sales, legal, engineering, IT and the R&D function; women actually received higher effectiveness ratings than males. Many of our stereotypes are obviously incorrect. Again, the concern about women not being able to perform well in those functional areas is resoundingly refuted by the data. Only in facilities management and maintenance do they not do well. 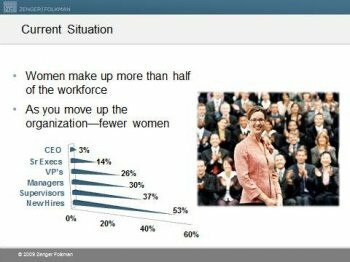 Finally, as women move up the ladder in an organization, the higher they move the more positively they are perceived. Zenger FolkmanTo the degree that senior executives and boards of directors are putting men into senior positions, fearing that women will not perform well at higher levels, we hope that this information adds to the assurance that they need not worry about that. Our Manager to purchase digital signage display in our online store, cheap. Barleywood Female University was a short-lived women's college in Rochester, New York. It is notable for having been one of the first institutions of higher learning for women in the state and for its connection to the University of Rochester.